If you Google the word “happy,” you get 484,000 results. At the very top of the first page of results is a listing for “Happy Harry’s,” the name a national drug store chain uses to distinguish—and, judging from the drawing of the kindly, smiling man who appears in the Happy Harry’s logo, to humanize—that most lucrative section of their countless identical franchise branches. The slow-moving line at a chain store pharmacy has never struck me as a happy place, the day leaking away as you wait interminably amid moaning soft rock behind the depressed, the aching, the phlegm-ridden, the venereally diseased, but according to Google it’s the top place for happy in all the cyber-accessible world. Also topping the Google search page for the word happy is a Japanese pop band, a Wikipedia entry for “happiness,” the movie Happy Feet, a couple different incomprehensible tech-related pursuits, the “Happy Tree Friends” (“cute, cuddly animals whose daily adventures always end up going horribly wrong”), something called HappyNews.com (“All the news that’s fun to print”), which is running as its top story today a piece about good reviews for a new book about the genocidal Khmer Rouge (good times! ), a USA Today article that passes on a psychological study revealing what makes people happy, and two different websites that claim to have the answer to the question of how to be happy. If you Google “Steve Braun,” you get 59,900 results, the majority having nothing to do with the man apparently poking at a dead alligator carcass with his bat in the baseball card on the above left. But his page on baseball-reference.com does come up, and there you can view the 15-year veteran’s admirable .371 career on-base percentage. Two sites down on the Google search page is a link to Steve Braun Baseball, an organization determined to pass on the ballpark wisdom of Steve Braun. Brye was told later, at the airport, that McRae had inferred that the play was racially motivated. It should be pointed out that funny business involving late-season batting races was not unheard of in baseball history, most notably in the 1910 race between Nap Lajoie and Ty Cobb (to read about the “chicanery” in that race scroll down to page 6 of the May ’01 issue of The Inside Game). And McRae was joined by black teammates Amos Otis and Dave Nelson in casting aspersions on Steve Brye’s supposed misplay (meanwhile, two of Brye’s black teammates, Rod Carew and Larry Hisle, were quick to dismiss the possibility of an anti-McRae conspiracy). I guess the only thing that could be said without any equivocation about the controversy was that nobody really came away from it (here’s that word again) happy. 1. Digress. Whenever life calls you to go from point A to point B, go to point C or point J or even Point Break, the ridiculous extreme sports action movie starring meatheads Keanu Reeves and Patrick Swayze, the latter’s early films including The Outsiders, which was a favorite of a girl I daydreamed about incessantly in the pubescent years directly following my baseball card collecting years, which had brought the shabby but beautiful symmetry of these Steve Brye and Steve Braun cards into my life. Where is that girl now? Let me see. Hold on. From Google: “Your search – ‘maureen gaidys’ – did not match any documents.” Ah, the sweet sad lost ungoogleable lands of youth! 3. Oh, god. What time is it? Christ, coming out of naps is like trying to crawl out from under a giant wet carpet. Give me a few minutes here . . . OK, on to point 3: Don’t finish what you start. Who has the energy to anyway? And even if you did have the energy, why would you want to finish something? Who wants things to end? You? Then how happy are you going to be when the sun goes supernova eventually? Hey, it’s just finishing what it starts, happy completely-obliterated-in-a-cosmic-explosion guy. Enjoy! 4. Yeah, uh, about point 4: See number 3, above. Now where was I? Who cares, really, at this point. Before I started weaving all over the road today I had it in mind that I was going to talk about the most aesthetically pleasing platoon in baseball history, that of Steve Brye and Steve Braun, and how the platoon and the mirroring 1975 cards which so aptly represent it make me wonder if being part of a platoon is the key to happiness in this annihilation-bound solar system. You do your part, someone else does their part, and together you make up a whole. When I was writing in very loose relation to Hal McRae a couple days ago about the happy feeling of getting high at boarding school, I neglected to get across the huge part the communal feeling played into creating the happiness. Just prior to those couple years at boarding school, I’d been an isolated, lonely kid, filling up the hours playing solitaire Stratomatic and dreaming about the ever unreachable, ungooglable Maureen Gaidys. Then at boarding school I was suddenly part of a group, part of a team with the goal of communal inebriation and flight and deep wild laughter. 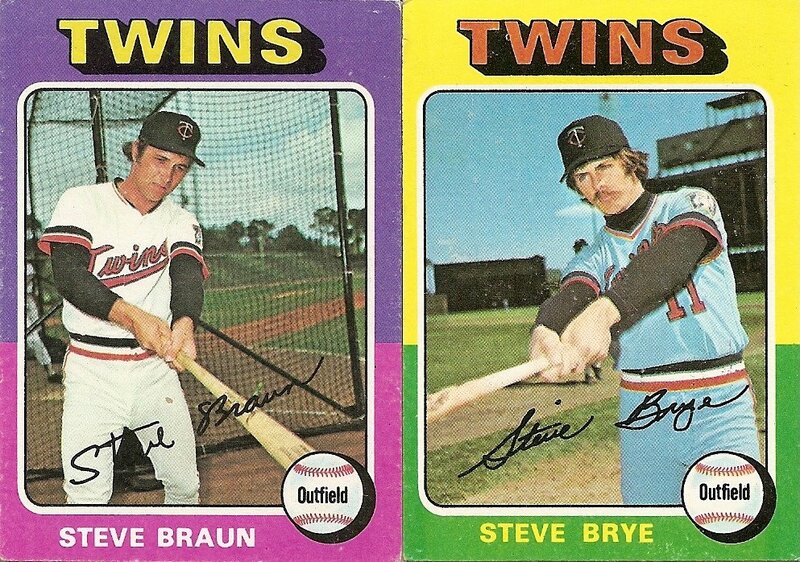 Suddenly there was a Steve Braun to my Steve Brye, a Steve Brye to my Steve Braun. Anyway, now, finally, three chapters into this longwinded saga, I’m finally going to get around to mentioning the titular subject: a boarding school friend of mine who I haven’t seen in over 20 years, Al Raymond. The title of this piece is based on his nickname: Happy Al. A Google search for “Happy Al” yields 27,100 results. A Google search for “Al Raymond” yields 12,500 results. A Google search for “Alan Raymond” yields 21,800 results. None of the results for any of these searches seems to reference the friend who helped bring to my time at boarding school some of the highest, happiest, laughingest hours of my life. Happy Al Raymond was named happy Al not because of smoking herbs. He was named Happy Al Raymond because he used to have phenomenal temper tantrums. We would wait outside his room and he would be in there freakin trashing his own stuff. He would really go off too. At this point I want to offer as a visual aid the aforementioned and promised Hal McRae video. For a look at what one of my friend Al’s tantrums looked and sounded like, approximately, please click on this link of Hal McRae going berserk. One day we were outside his room [during one of his tantrums] and Wags was like “we should call him Happy Al.” I cried laffing and that was that – HAPPY AL RAYMOND FROM NOW ON. It kills me that he went to prison – for the GOP no less. Until very recently, Happy Harry’s was strictly a Delaware business (maybe a few locations in south Jersey, Northeastern Maryland and southwestern Philly). But mainly, Delaware. Though there was barely any difference between the prices, selection etc Happy Harry’s had a “local” feel that made it superior to the CVSs and RiteAids that also wanted your $$ for cigarettes and cold medicine. And so it made me unhappy to see it was sold to Walgreens last year. For a few short days in the magical summer of 1989, the Coke machine outside the Happy Harry’s at Choate & Main Streets in Newark, Del. malfunctioned, providing you with 4 quarters, a soda and your dollar bill back for every dollar bill you inserted! Now that was happiness. 3. Your four-point plan for How to Be Happy is alarmingly close to the philosophy I didn’t know I lived by. In fact I did two other things before the word “by” and the period in the last sentence (seriously). Meanwhile, I have a theory that every inside-the-park home run since the Braves moved out of Boston has actually been a single and a three-base error or, at best, a double and a two-base error. In fact, I’d bet that if you had two identical plays with the batter stopping at third on the first, but coming home to score on the second, the first would be ruled a hit-plus-error and the second would be ruled an inside-the-park home run. 5. Digress, Procrastinate, heck – why start? 2: Napping at work is a tough one. Someone should come up with clear fake eyelids. I’d buy them, at Walgreens if necessary. 3: That’s an interesting (and disillusioning) theory about inside-the-parkers, Cliff. I guess I haven’t seen enough of ’em to really weigh in, but it seems that the one’s I’m most familiar with, at Fenway, hinge most often on the wild bounces that the jagged fencing sometimes produce. It’d be hard to assign an error for those liners that pinball around down by the Pesky Pole before scooting out toward centerfield. 7. Happy Al could be a variety of a personality in my husband’s fraternity, known affectionately as Dr. Jekyll and Mr. Beer. One minute, slit-eyed silence; the next, Viking berserker. 2. I have slept under my desk at work. There is a technique. of course if you have an office with a door, just sleep on top of the desk. Who would win a head-to-head tantrum fest? Hal McRae. Lou Pinella. Billy Martin. 8. 7 – If I had office with a door then I would bring a pillow to work. Or a tv. 9. 6 Seems to me most of them happen when an outfielder either falls down or makes an ill advised dive for a ball he should have fielded on a hop. Since you mention Fenway, think of Trot Nixon’s in 2005 that skipped past a diving Melky Cabrera. If Melky cuts the ball off rather than trying to catch it on a bounce it’s a single. 10. I think it was Scott Adams who came up with the foolproof way to sleep at your desk. Put an important document or book on the floor, put your head on the desk with your arm hanging right over the document. If anyone comes in the door, simply pick it up and put it back on your desk. I’m glad I’m not the only one who googles old girlfriends. Tantrum fest? Boy, even though Hal’s got the video backing up his claim to the crown, I’ve gotta go with Lou. Then again, if it was a competition, I think Billy Martin would be willing to keep ranting until his eyeballs fell out of his sockets. I’m sure you’re not, spudrph, but in my case I was googling a girl who was as close to being my girlfriend as I am to being able to fly. Also, in case anybody is wondering about the lack of posts the last few days: I’m hoping to provide the conclusion to this creaky saga of happiness, platoons, tantrums, substance abuse, and the subversion of the American democratic process sometime this weekend. My time’s been drained this week by my desire to actually finish a short piece of fiction I am working on. OK, and laziness. Always laziness. 12. Fantastic stuff, Josh. This blog gets better and better with each entry. Your four-point guide revealed to me some inner truth to me about my own writing, in that my penchant for lengthy, dependent-clause-dependent and em-dash-laden sentences — the kind I’m writing right now, with as much ease as a Greg Maddux painting the corners — are in fact not only a form of digression but of procrastination, delaying my arrival at the point of whatever it is I’m saying, and yet prolonging my happiness for imparting this particularly tangential piece of information which reveals my deeper understanding of the topic at hand (poor Cliff can attest to this, having edited some of my Baseball Prospectus 2007 ramblings). Why hurry to Point B when the meandering road between there and Point A is so damn fun?